The first step to overclocking is to download appropriate apps to test your settings. There's a large variety of programs available, so I'm just going to list a few here. Testing is actually fairly simple. I'd suggest running HWMonitor and Real Temp at the same time, to make sure you have accurate sensor readings. 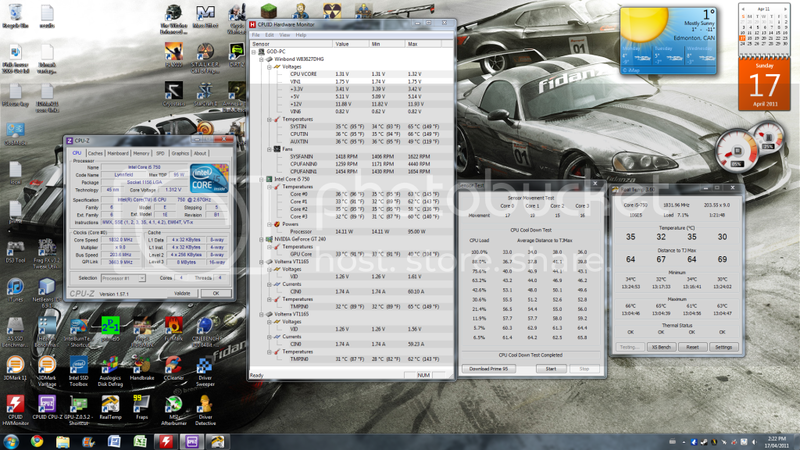 Leaving these programs open to monitor temperatures, run a stress test. Generally speaking, the more RAM you use, the more stability will depend on RAM. Specifically with IBT, you can set a low RAM usage (standard) with a very high amount of passes (20-30) to check almost exclusively CPU stability. If CPU passes, then it is recommended to do at least 10 passes on Maximum stress level to make sure everything is good. Prime95 is much less sensitive to errors than IBT, but it is still a good test to run. However, it takes quite a bit longer. It would be a good idea to run it overnight, as it is typically recommended to get an 8 hour test without errors to be almost guaranteed stable. This, obviously, should be the last test you run as it is the most time consuming. With any CPU, there is a thermal limit you shouldn't go too far over. Typical for Intel CPUs is 72C. AMD CPUs are a little different, but overall if you keep a CPU under 70C you should be ok. If stress tests are below 80C, it might be a little bit of a risk but you can still call that acceptable because under normal loads like in gaming and encoding videos, the temperature should be lower - just make sure you verify that. Ok, so you should know understand most of the important options in your BIOS, how they are related, and how to test an overclock once you make changes. But what changes should you make? This will depend highly on your system, so I can only give some more general advice. Remember that OCing is more of an experience than anything. Take your time with it, don't jump too high very quickly, and always, always test. If you have an unlocked CPU, this becomes rather simple. First and foremost, set your RAM to manufacturer specifications and test it - without overclocking the CPU. This is important to make sure your RAM is ok. Once you've done that (let's say 10 IBT passes at Max usage - or at least 2 passes of Memtest86+) you can start increasing your CPU multiplier. I would suggest not making more than 400mhz jumps above stock up to 4ghz, and not more than 100mhz after that. Test after each change.